I get asked a lot about how organic farmers control weeds without the use of herbicides. (And with the rise and spread of herbicide-resistant weeds, the issue is on the mind of many conventional farmers, too.) Some naturally assume that in the absence of herbicides, hand-weeding or deep tillage, along with all the drawbacks of each of those methods, are the only remaining options. 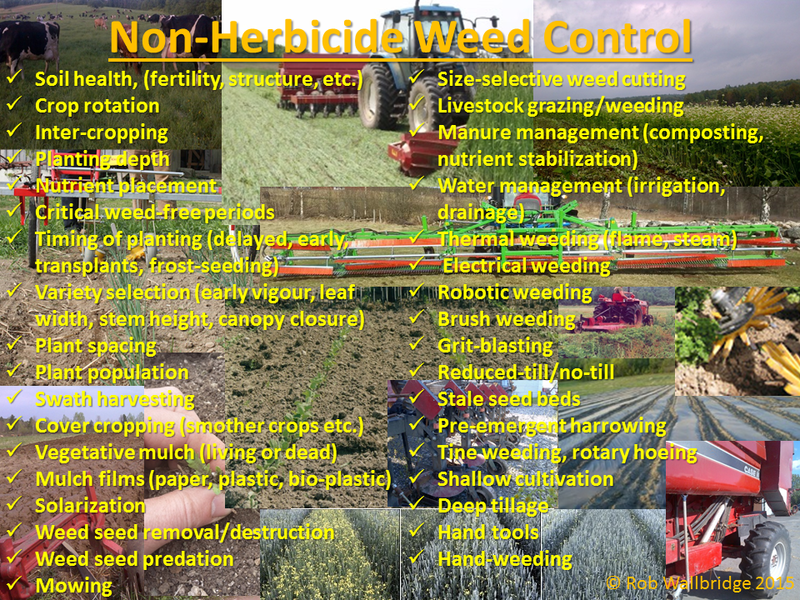 Here, I’ve done my best to list all of the weed control strategies available to farmers. Not every one of these options is available to every farmer, of course – much depends on the crop type, the environment, the weather, and the scale and resources of each farm. By the same token, many farmers will use some of these tools without really thinking about them because they are integrated into best management practices to achieve a number of goals. Farmers who successfully reduce or eliminate herbicide use are those who consider all the options and incorporate as many strategies as practical into their farm management systems. Which ones have I missed mentioning? ← Wordless Wednesday: Kids & trees both grow up fast! May I keep and share your meme? Yes, of course – naturally I’d appreciate it if you retained credit to the source. Somebody noted that I should have added “sanitation” to the list – clean seed, equipment, and field edges all help prevent the spread of weeds! hey rob, do you use any pesticides yourself? any of the organic-approved ones you like, if you do? Hi Pat, Sorry I missed answering your question earlier! I have not had to use any pesticides on my farm for the past several years. I control weeds using a combination of crop rotation, cover crops, reduced tillage, shallow tillage, transplanting, and mulch films. I’ve invested a lot in creating healthy, well-mineralized soils to grow plants with stronger resistance to pests and disease, and I use techniques like variety selection, transplanting, trap cropping, and creating habitat for benefical insects to control insects. The full explanations really deserve some blog posts of their own! In the past, I have had to resort to limited applications of approved pest control products when the measures I described above (and more!) weren’t sufficient for one reason or another (and it’s under these circumstances that organic certification standards permit the use of approved products). So I’m not going to tempt fate by saying that I’ll never use pesticides, but I’m going to continue to do my best to manage my farm so that they are not required!